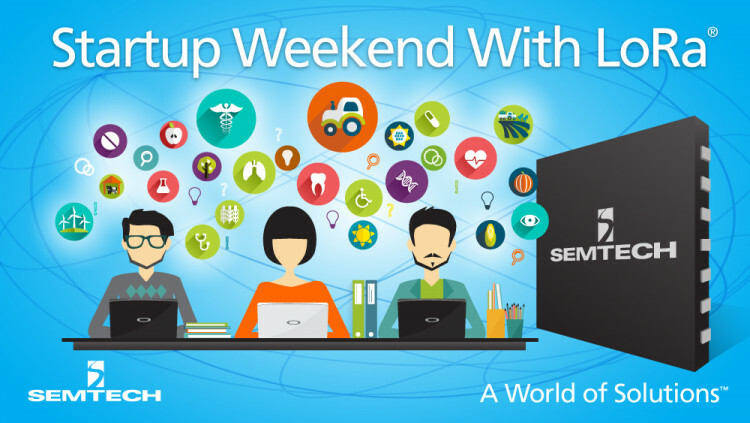 Semtech Corporation (Nasdaq: SMTC), a leading supplier of analog and mixed-signal semiconductors, today announced its participation as the technology sponsor of Startup Weekend Ventura County at Rancho Campana High School in Camarillo, Calif. on March 11-13. Organized by Dignity Health St. John’s Hospitals and Camarillo Chamber of Commerce, Startup Weekend Ventura County invites programmers, system architects, application designers and entrepreneurs to address healthcare and agriculture needs by creating working Internet of Things (IoT) or connected solutions in less than 54 hours. Participants will use a LoRa®-enabled low-power wide-area network (LPWAN) to collect valuable data and to design an innovative IoT solution for a healthcare or agriculture need of their choice. Semtech’s LoRa wireless RF technology is a widely used solution for LPWANs that allows long-range connectivity, extended battery life and standardized protocol for streamlined network/application integration. Leading telecom operators have launched public, LoRa-based networks in various countries throughout the world, including France (Orange and Bouygues Telecom), Switzerland (Swisscom), Luxembourg and Belgium (Proximus), Russia (The Lace Company), South Africa (FastNet), The Netherlands (KPN), South Korea (SK Telecom), and more. Senet, a leading network as a service (NaaS) provider in North America, has launched an LPWAN in Ventura County for participants to connect to with their IoT devices. Startup Weekend Ventura County is endorsed by the Ventura County Medical Association, Monsanto, the Ventura County Agricultural Commissioner and State Assemblywoman Jacqui Irwin. Local business leaders will speak at the event, serve as mentors throughout the weekend and judge the final projects. Semtech’s LoRa team has participated in several other IoT workshops and hackathons worldwide to introduce and disseminate its LoRaWAN™ solution. Beyond healthcare and agriculture, LoRa technology is being used worldwide in key applications such as detecting gas leaks in Korea, monitoring volcano and earthquakes in Japan, and a variety of Smart city applications that help cities control streetlights, traffic signals, and natural resources such as water, gas and electricity. For more information about LoRa wireless RF technology and the LoRaWAN protocol, visit www.semtech.com/wireless-rf/lora.html.